It's that time of year again. As the temperature drops our Arctic friends once again return to Massachusetts beaches. You can see in the photo above a seal in Rockport, MA that was monitored by the Whale Center of New England (WCNE). Why are these seals called harp seals? At some point in time, people thought the black pattern on their back resembled the musical instrument (I don't see it). One of our field volunteers, Patty, took the above photo. As we have mentioned in previous posts these animals are protected by the Marine Mammal Protection Act. It is against federal law to get too close (closer than 150 feet), harass or change the behavior of the seals in any way. Above left the seal is not waving hello. This is actually a sign of stress and that you are probably too close. NEAq staff and trained field volunteers will do what is called a "close approach" to these animal to look for signs of injury or assess activity/behavior of the animal. It is also illegal to allow your pet to approach these animals, too (above right). Seals are wild animals that can carry disease that may be transmissable to your pet and you. They also have sharp teeth and claws that they will use if threatened. One defensive mechanism harp seals often utilize is to "play dead". 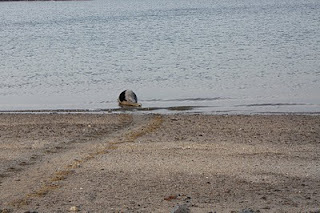 The seal in the photo above on the right is a juvenile seal, which is using this defensive technique as the dog approaches. Keeping pets on a leash this time of year on the beach is always a good practice to avoid these interactions. Above is a more typical view of these "ice seals." You will find them resting and enjoying the ice and snow in the arctic. The above photo was taken in Hull by the reporting party. These seals along with some other arctic seals are born on pack ice, which is why they are sometimes referred to as ice seals. They do not get stuck to the ice, and all seals are semi-aquatic which means they also spend time out of the water on land, ice or snow. 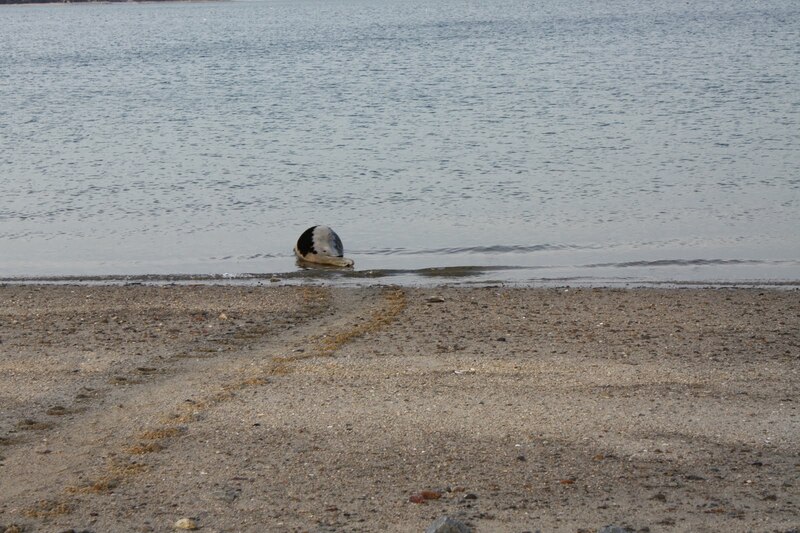 It is not uncommon to have a seal spend several tide cycles out of the water in the same spot. 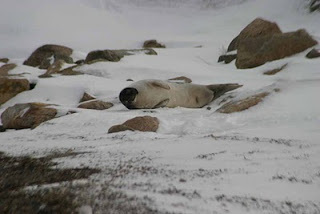 This seal in the photo above was resting in a marsh in Essex, Mass. Another adult harp seal! We don't see many adult harps on Martha's Vineyard but the above photo is one of several that we have monitored in the past weeks on the island. 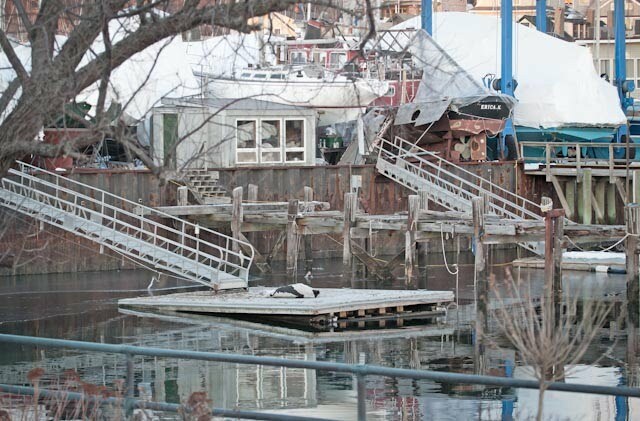 Above was a seal that was in Marblehead today. Clearly state where the seal is. 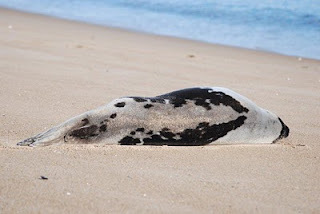 Give town name and what beach the seal is on. Also if there is a close address give that too. We will need your phone number to call you back. Slowly state your number. Most importantly enjoy the moment from a safe distance! All of the seals mentioned above have done what this seal (below) was doing: returning to the ocean. Another seal heads back in to the water. Possibly returning to the Arctic, or maybe it will stop off in Maine and visit our stranding partners to the north before heading home to Canada!